The Coconut Crab is a large terrestrial arthropod. Full grown adults have hardened chitin plating for protection along with a pair of very large and powerful pincers as well as four pairs of walking legs. Adults can weigh as much as 9lbs and reach a size of 1m from leg to leg. The color of the exoskeleton depends largely on the location. They range in colors from blue, orange, brown and red. In order to live on land, the Coconut crab has developed organs known as "branchiostegal lungs" that allow them to breath oxygen from the air. Coconut crabs are considered to be scavengers and will eat various types of fleshy fruits, rodents, smaller crustaceans, decaying flesh and as their name suggests, coconuts. In order to locate food, the Coconut Crab also has a very acutes sense of smell similar to that of insects. They mate between late summer and autumn. Eggs are deposited on land and moved towards the sea when the hatching period approaches. Larvae are planktonic for 3-4 weeks before developing into juveniles that use small shells to protect their soft abdomens. As they continue to grow, the chitin plates develop to protect the abdomen and the Coconut Crab becomes completely terrestrial. 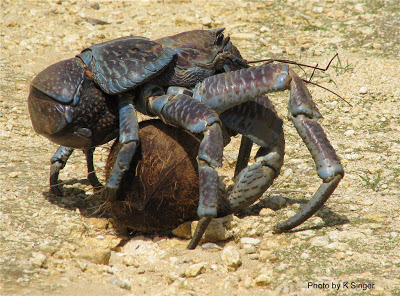 Coconut Crabs are native to most of the Indo-Pacific Islands. They prefer to live along the coast and hide under rocks or burrows during the day before coming out and foraging during the night. Once mature, adult Coconut Crabs are completely terrestrial. The Coconut Crabs are an important food source for native populations of pacific islanders. In some cases, the Coconut Crab is protected due to over-hunting. From a scientific standpoint, the biology and taxonomy of the Coconut Crab provides evidence of convergent evolution between crustaceans and insects. "Coconut Crab Fact File." Archive.org. Web. 16 April 2013. Retrieved from: http://www.arkive.org/coconut-crab/birgus-latro/.